With a smile and a handshake for each face, Robbie Brady makes his way around the press pack before sitting down. When you've been out of the fold for so long, even the chores that can test the patience don't seem so bad. During a lost year on the sidelines, the injured professional can tend to feel like the forgotten man. Brady is clearly happy to be back in the centre of the action again. When he clattered his knee into his pal Harry Maguire in an innocent clash last December, the Dubliner knew that a spell on the sidelines was inevitable. His patellar tendon had ruptured. He was thinking six months initially, yet there were medics who suggested his left knee might not feel right for 12-18 months. Brady was on course for a summer comeback with Burnley and kept meeting setbacks at the final hurdle. He's crossed that now with a start and two Premier League sub appearances convincing the versatile talent that normal business has resumed. "But there are a lot worse things happening in the world than me hurting my knee. You have ups and downs throughout the thing but you just have to get to grips with it. "You forget how much you need your knee until you can't bend it at all. It ended up healing too well and it got stuck, so I had to go back for a second mini operation, which put the bend back into it. Little things like that you don't expect and are a bit annoying, but you have to deal with it." He acknowledges the mental aspect is arguably more demanding than the physical duties. "If you've a bad day, you've a bad day but you just have to try and stay positive. You sort of get your head around the physical side of things after a couple of months. "But when you're in the gym on your own day in and day out, it gets that little bit lonely. You don't get to mingle with the lads that much. You're literally on your own for the majority of it. It was probably ten months near enough on my own. Drive in the with the lads and then I wouldn't see them and then going home again. "I think that side of things is a lot, lot tougher." Ireland assistant Roy Keane was amongst those to offer his own advice on injury woe. Brady's last international appearance was the World Cup play-off defeat to Denmark and a lot of water has passed under the bridge since then. He was understandably reluctant to delve into the detail. Stephen Ward is part of his carpool. Brady couldn't plead ignorance, but revisiting WhatsAppgate is a problem he could do without. What has changed dramatically is the profile of the dressing room, even within a relatively short time-frame. 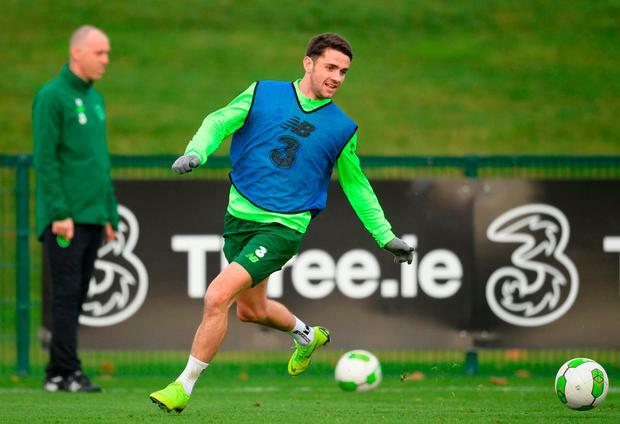 John O'Shea, Wes Hoolahan and Daryl Murphy have all retired from the Irish scene. Glenn Whelan is back for a farewell game. Aiden McGeady has dropped off the radar. Brady is now further up the chain of seniority. "The familiar faces are gone and a rebuilding stage has started," he concedes. "I still speak to the lads who've left. They were great for me and helped me. "I'm that little bit older now and hopefully wiser so hopefully I can help these young lads coming in. Some of them have great ability so if I can help them as well as the senior lads who helped me, I will try and give them a hand along the way. "Obviously we haven't got the results we wanted over the last couple of trips, which has been difficult to watch because you're no use to anyone, and that's not by choice. "It's a massive transition with older lads who have stopped playing and younger ones coming in. I came in the last trip (October games with Denmark and Wales) to show my face and I think, although it's got a different feel, it's gelling together well. "Everyone is getting to know each other that bit better. Please God we can get a couple of good results." Brady has been minded by Sean Dyche, yet he asserts that he feels ready to start both of these November internationals if called upon. Northern Ireland are up first tomorrow ahead of the competitive return with Denmark in Aarhus on Monday. With James McClean suspended for that fixture, Brady's presence would be welcomed, especially in the dead ball department. O'Neill has been in regular contact too and travelled with Keane to watch Brady play an U-23 match last month. He has cautioned against expecting too much, too soon. "Asking Brady now to be the complete matchwinner again after being a year out of the game is asking a lot," said the Ireland manager. "He's had things to consider, but it's great to have him back, it's a big boost for us." Brady understands that more is expected of him now he's moved beyond the new kid on the block status. "If there is an expectation on me, then I will just have to deal with it," he stresses. "I don't feel pressure." He's a married man now and his daughter, Halle, is five. There's a second child on the way next May. Brady's focus now is on creating another major tournament memory to rival his header in Lille in 2016. The prospect of missing out on a Euros that will be partially staged in his home city is unthinkable. "It wouldn't feel right," he stresses. "Coming to watch games here wouldn't be the same. It would be amazing to be a part of that but there's a lot of games between now and then. We need to pick up some memorable results. "My form probably hasn't been as high as it was at the Euros but I'll have to get back to that level if I want to push this team on. "You've always got to try and create new memories."